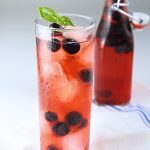 A combination of cherries, strawberries, blueberries and cranberries create one flavorful and fruity Homemade Juice drink. This recipe makes a good sized batch that can be served at a large gathering, or just kept refrigerated until needed. 1. First, bring water to a boil and add the berries. 2. Allow mixture to come to a rolling boil and then reduce the heat to med-low and simmer for 15 min. 3. After that, turn heat off and stir in the sugar and lemon juice. Allow to sit for at least 20 min (or 1 hour if the time allows) for the flavors to meld. Finally, strain and pour into a jug. Keep refrigerated until needed. Note: To see a visual of how homemade juice is made please see similar recipe . Bring water to a boil and add the berries. Allow mixture to come to a rolling boil and then reduce the heat to med-low and simmer for 15 min. Turn heat off and stir in the sugar and lemon juice. Allow to sit for at least 20 min (or 1 hour if the time allows) for the flavors to meld. Strain and pour into a jug. Keep refrigerated until needed.